George Harold Rodriguez of Grafton, WI died Monday, March 25th, 2019. Loving husband of Ilona, devoted father to Derek (Callista), Kathryn (John) and Darren. Grandfather of Evan, Margaret and Lydia. George was born in Montreal, Quebec, Canada in September of 1934. As a graduate of McGill University in Montreal, he worked for Northern Electric Company and married his devoted secretary in 1963, sharing her love for the pipe organ and church organ concerts. They moved to Youngwood, PA where he worked for Westinghouse Electric. Before children arrived, he decided to build a Schober two-manual electronic organ, designing the wood cabinet himself. Two years later they moved to Williamstown, MA where he worked as an Engineer for Sprague Electric Company in North Adams. He built his first kayak in the living room of their apartment. In 1984 they moved to Grafton where he took a position with Cera-Mite Corporation. 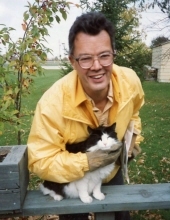 George was a volunteer at Wisconsin Humane Society where he adopted his beloved dog Dixie, and cat, Molly. He loved to build things. George appreciated the outdoors, loved hiking, fishing, kayaking, biking, cross-country skiing, enjoying the different seasons of nature. A Memorial Service will be held at Mueller Funeral Home, 979 N. Green Bay Rd. in Grafton on Saturday, March 30th with visitation from 1:00 to 3:00. Donations to charity of your choice or Wisconsin Humane Society Ozaukee Campus would be appreciated. To send flowers or a remembrance gift to the family of George H. Rodriguez, please visit our Tribute Store. "Email Address" would like to share the life celebration of George H. Rodriguez. Click on the "link" to go to share a favorite memory or leave a condolence message for the family.